Red Rock Products, Inc. operates as an online retailer serving the health and fitness markets. The company operates seven e-commerce sites: EverythingYoga.com, a yoga clothing, mat, and accessories retailer; BestInsoles.com, a direct-to-consumer seller of orthotic products; BestSwimming.com, a site that provides swim gear to individuals and clubs, Footrite.com, a site that focuses on foot care and pain relief; FitnessToys.com, Medibrace.com, and InsolesFast.com. Red Rock Products, Inc. was founded in 2007. 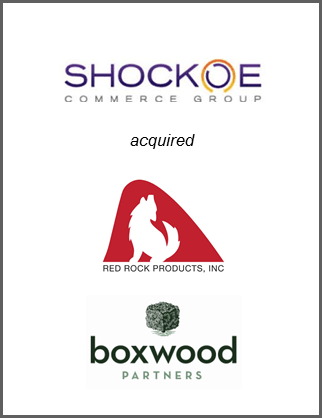 Shockoe Commerce Group, LLC is a portfolio company of Boxwood Capital Partners. This acquisition complements Shockoe Commerce’s acquisitions of Yoga Direct and Yoga Accessories and positions the company as a leading supplier within the attractive and growing yoga products market.